I was quite amazed to find out last week, when visiting Leicester Cathedral, that the small coat of arms that can be seen on the front part of the tomb was made by a skilled craftsman called Thomas Greenaway, who is one of only a handful of people who use the 16th Century craft of Pietra Dura (Italian for ‘hard stone’). This is a highly specialised way of making a picture by a method that is a kind of cross between a jigsaw puzzle and a mosaic. It originated in Florence and is still taught there today. The shield is not painted or made out of some plastic material, but is composed from three hundred and fifty small pieces of semi-precious stones – in this case Lapis Lazuli from Afghanistan, Duke’s Red limestone from Derbyshire (which is very rare) and Yellow Chalcedony from Italy. Each lion is composed of twenty pieces of stone and the claws are Lapis Lazuli. All the pieces are precisely cut to shape and fitted using traditional sixteenth century techniques and the Coat of Arms took two months to complete. Click on the picture below to visit Thomas Greenaway’s site to find out more. There is a great five minute video of how the tomb was carved, polished, moved and laid, including the making of the Coat of Arms here. Thanks to Thomas Greenaway for permission to use this picture of the shield. 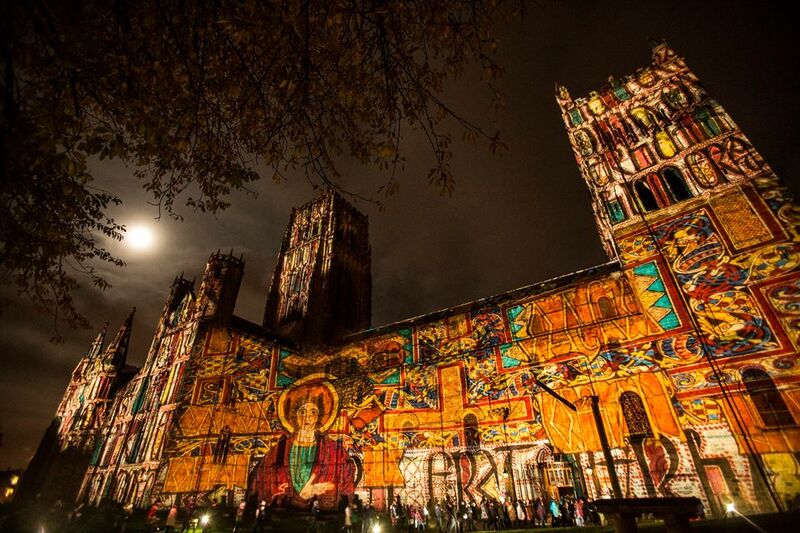 Durham’s Lumiere festival will be taking place on November 12-15. It is Britain’s largest light festival. Most impressive perhaps is the illumination of the great cathedral on its eminent position above the river, in which medieval images are projected upon the ancient stonework and towers. Durham was well-known to Richard III; he and his wife Anne were admitted to the fraternity of the cathedral priory in 1474 when he was still Duke of Gloucester. He had a special veneration toward the northern St Cuthbert, whose shrine was (and still is today) a prominent feature of the cathedral. In 1484, as King, Richard visited Cuthbert’s shrine while on progress and presented the monks with his parliamentary robe of blue velvet, stitched with lions in pure gold. If Richard were to come back today, he would recognise the building and much of its surrounds for the cathedral is little changed since his time…although Cuthbert’s shrine was robbed out in the Reformation. Before that time, it was heaped in jewels worth a king’s ransom and festooned with unusual offerings, including narwhal horns which many thought were unicorn’s horns and hence magical. I don’t know what Richard would think of modern illuminations but the cathedral looks so dramatic and awe-inspiring with scenes from its long history projected onto its architecture…I like to think he might approve! 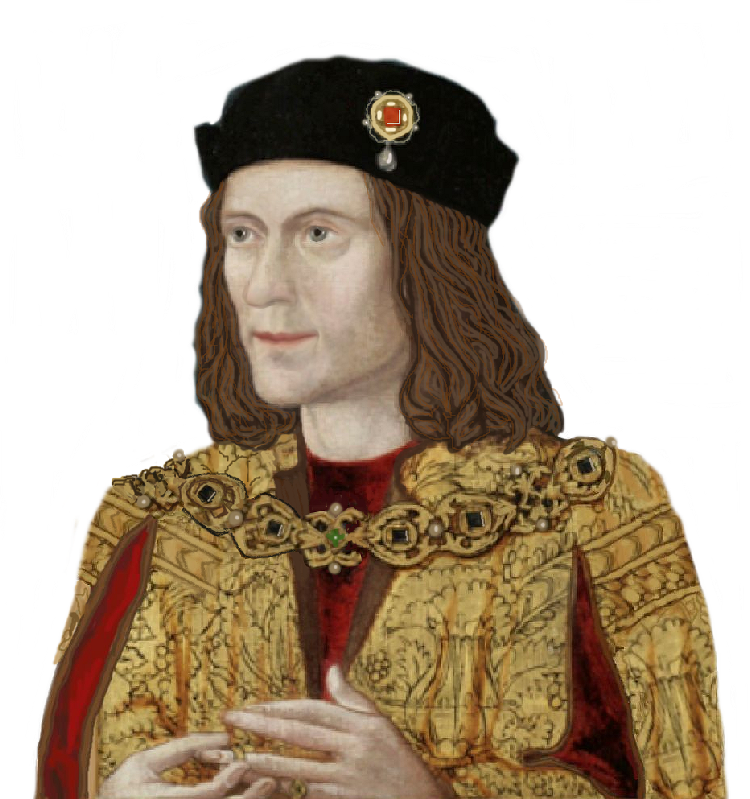 Anti-Ricardians often partly justify their dislike of Richard III on account of his unattractive crown-hunger, claiming that he was always desperate to be king, spent his life plotting to this end and ruthlessly eliminating anyone who stood in his way, and cite as proof the prompt “usurpation” of his nephew Edward V in 1483. I’ve always found this arrant nonsense. At the time of Richard’s birth in 1452, the throne was squarely occupied by the House of Lancaster; and while many people felt that his father Richard, Duke of York would make a better king than Henry VI, the Yorkist claim was not at this point being actively pursued. Moreover, having three healthy older brothers above him in the pecking order for titles, as a child Richard was but a minor princeling – and when Queen Margaret produced a Lancastrian Prince of Wales in 1453, neither he nor his brothers were remotely serious contenders for the crown. The situation didn’t change until 1460, when Richard of York’s short-lived stint as heir-apparent raised young Dyckon to fifth in line to the throne. Then he edged a step closer when the Duke’s death at Wakefield was avenged at Towton in 1461 and his eldest brother confirmed as King Edward IV; but thereafter, his loyalty was absolute and his own best interests served by maintaining Edward’s position. I say this not as a ‘bride of St Richard’ who can believe no wrong of him, but because it doesn’t seem to square with the evidence. Think about it: their relationship made Richard of Gloucester the second most powerful magnate in the country, effectively king of the North, able to enjoy all the wealth and prestige without the dangers and burdens of wearing the crown. Edward was Richard’s protector and guarantor, his bulwark against Woodville ambitions; had he lived for another ten or twenty years, (by no means unlikely, given the robust health of their parents), his two sons would have been grown men with their own affinities, no doubt raised by their father to view their uncle as an indispensable political ally, and Richard would not have been king. Ah, you say, but that didn’t happen – the black-hearted villain pinched his nephew’s crown practically before his brother’s body was cold! So he must have started planning his coup the moment he heard of Edward’s death – mustn’t he? Actually, no. Proceedings at the recent Richard III Foundation Inc. conference make it seem highly unlikely that Richard’s actions in the spring of 1483 were simply designed to lull the Woodvilles into a false sense of security while he laid his plans for usurpation. Susan Troxell, in her discussion of Richard’s heraldic emblem, showed the image of a gold angel naming Edward V as king and bearing a boar’s head mint-mark, dating it to the short period of the Protectorate. Surely issuing coinage is a step too far in terms of subterfuge; surely the implication is rather that Richard did indeed acknowledge his nephew as king, while simultaneously asserting his own intention to be firmly involved with the reign. Subsequently, he might have been satisfied with the role of Protector if he could have felt confident that the young king’s family would accept his pre-eminence. However, considering the dread fates of recent Protectors (Henry VI’s uncle Humphrey, the previous Duke of Gloucester, and his own father Richard), he had good reason to lack this confidence – especially as Professor Peter Hancock has now demonstrated, by an ingenious piece of historical detective work, that William Lord Hastings was not in London on 25th April 1483, but at his castle of Ashby where it seems likely that Richard met him as he travelled down from the north. There he would have received the unwelcome news that the Woodvilles thought they could rule very nicely without him – hence his precipitate actions in arresting Earl Rivers, Richard Grey and Thomas Vaughn and securing the person of Edward V at Stoney Stratford on 30th April. Taking these two pieces of evidence together, I think it’s safe to say that in the immediate aftermath of Edward IV’s death, Richard of Gloucester had no thought of taking the throne for himself; this idea did not develop until the emergence of the pre-contract story and the dawning realisation that, just like his father, he had no choice but to press his own claim to the throne if he wanted to safeguard himself and his family’s future. 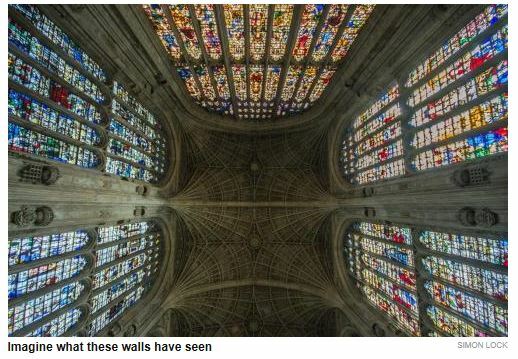 Richard III and King’s College Chapel, Cambridge…. Imprisonment? It may well be true, I have no idea, but somehow this does not sound like Richard, unless….is it possible he had some personal plan for this chapel? For his family? This is just a wild guess on my part. According to the Shorter Oxford English Dictionary, the noun Ricardianism means ‘support for or advocacy of Richard III’. Even though I have been a supporter of king Richard III for almost six decades, I am reluctant to describe myself as a Ricardian since it implies a narrow interest in one man. I prefer to call myself a Revisionist, which implies a wider interest. This is a personal eccentricity, which I have to bear. I mean no criticism or offence to Ricardians and I sincerely hope none is taken by my frankness. However, the distinction is important to me because it has informed my personal search for the real king Richard. I have been looking for him since I was a pre-pubescent schoolboy in East London in the fifties. During that time I have met many different ‘Richards’; the purpose of this piece is to share a few of them with you. And he doesn’t disappoint: from the moment he walks on the set, he frames each event for us. He announces it in advance, providing a running commentary and evaluating its success. He seduces a grieving widow as she accompanies her dead husband’s coffin. He murders anyone who gets in his way: his brother, his wife, his nephews, his friend and comrade in arms. He lies, tricks, boasts, leers, jeers and laughs his way to the throne, delighting in his own malignity and making the camera a mirror for his vanity. And then he falls: spectacularly. Richmond invades from France and takes the initiative. His ‘supporters’ desert him and the hunchback metaphor rises to the surface; he is racked with the ghosts of those he has murdered. Typically, his courage is unimpaired. At Bosworth on his last day on earth he tells us “Richard is himself again”. Fighting with supernatural courage and ferocity to retain his life and crown; finally his enemies overwhelm him. In the end only his voice sours: “ a horse, a horse, my kingdom for a horse... Ultimately, Richard’s death is as much a performance as his life. Great stuff! I still watch that film today and I still have an almost irresistible urge to punch Stanley Baker’s lights out. To be honest I have only read three Ricardian novels and I only enjoyed two of them. Pride of place must go to Josephine Tey. Her novel ‘The Daughter of Time’ set a very high standard for novelists to aspire too during the sixty plus years since Inspector Alan Grant made his first appearance in Ricardian literature. As an experienced Scotland Yard detective Grant has a reputation for being able to spot a criminal on sight. However, when, on being shown the NPG portrait of Richard III, he places him on the bench rather than in the dock, Grant begins to fret. From his hospitable bed and with the help of a young American researcher called Brett Carradine he begins an investigation into the allegations against king Richard, which Grant thinks changes history. Grant sees Richard as a man much traduced and he blames the historians for this. His Richard is a virtuous man, honest and loyal to a fault, brave and an able administrator. He is just, with a genuine care for the common weal. As a former soldier himself, Grant is hugely impressed with Richard’s military career (‘he was a brigadier at eighteen’). It took me a few years to find out that Inspector Grant’s version of Richard was based on the work of Sir Clement Markham. Published at the turn of the twentieth century. Markham’s account is an elegant but flawed defence of Richard, which modern scholars tend to regard like the ‘curates egg’: it is good in parts. It is the Tudor based history of Richard started by Sir Thomas More and completed by William Shakespeare, which still dominates the public’s perception of him as a regicide, homicide, usurper and tyrant. This is the Tudor view of Richard that took hold immediately after Bosworth. Mindful of his weak claim to the throne, Henry VII ‘encouraged’ his subjects to believe that his victory and accession was the preordained ending of Richard’s tyrannical reign and, further, that his marriage to Elizabeth of York was the heaven-sent ending of thirty years of internecine civil wars. It is this doctrine that Professor EMW Tillyard calls the ‘Tudor Myth’ It is intended to promote the Tudor worldview not just by blackening Richard’s name but by directing what people should think about the Tudors, their claim to the throne and English history. It was a political necessity to blacken Richard’s name to enable the purity of the Tudor dynasty to shine ever brighter. Professor Paul Murray Kendall describes the growth of this process: “In the court of king Henry VII…there existed among the men who conspired against king Richard III and bought his overthrow a body of opinion, continually enlarged by tales and conjectures concerning the past, which they had conquered. It was out of this amorphous mass of fact, reminiscence, hearsay growing ever more colourful and detailed with the passing years, that the authors of Henry VIII’s day fashioned the (Tudor) tradition.” The problem with the Tudor tradition is not simply that it represents the history of the victors, but also that it is confused and conflicting, and it is based on nothing more than rumour and gossip. It is also clear that Henry VII tampered with the historical record. He ordered Titulus Regius, Richard’s Act of Settlement, to be destroyed without being read, on pain of punishment. He also allowed his official Tudor historian to publish a false account of Richards’s title and his accession. This whole episode highlights the pivotal role played by historians in shaping our perception of history. Self evidently, historical facts are the building blocks of history and historians must not get them wrong. It was the historian EH Clark who wrote: “I am reminded of Houseman’s remark that ‘accuracy is a duty not a virtue’. To praise a historian for his accuracy is like praising an architect for using properly seasoned wood and properly mixed concrete in his buildings.” Nonetheless, facts do not necessarily speak for themselves. Peoples’ opinions are influenced by the selection and arrangement of appropriate facts. And it is the historians who decide what facts are important, and their context. Necessarily, this is a subjective exercise; it is a mistake to think that facts exist independently of a historian’s interpretation. What constitutes an important ‘historical fact’ as opposed to an ordinary unhistorical fact depends on the historian’s viewpoint. For instance, our picture of England during Richard’s reign is incomplete. This is not just due to gaps in the sources or records but also to the fact that those we do have are largely written by a small number of people in southeastern England. We know quite a bit about the discontent of the Yorkist gentry in London and the south, but we know little or nothing about how his reign was viewed outside that area. Our view of Richard’s reign has been pre-determined for us by people who, for whatever reason, took a particular a view and preserved those ‘facts’ that supported their view. Not only are the facts we do have subjective; we almost certainly do not have all the facts. These problems raise important ethical and professional questions about impartiality and objectivity. Can historians remain objective? Should they be objective? Professor John Gillingham explores these questions in an essay about Richard’s character. He identifies the dichotomy between Richard’s behavior before 1483 and the nature of his alleged crimes thereafter as the central problem in explaining his character, which he argue raises ‘unhelpful issues of guilt and innocence’. It creates a hostile, adversarial environment in which every scrap of information is heavily scrutinized in case it sheds light on the mysteries of Richard’s protectorship and reign. He argues that the whole process has developed the features of a courtroom trial (indeed it has). This is awkward because (in the words of historian David Knowles) “…an historian is not a judge, much less a hanging judge” Professor Gillingham adds that it is this reluctance to judge historical characters, allied (in this case) to a realization that “… the evidence base is non-existent” that has led to an accommodation between the traditionalist historians and Ricardians. He may well be right, but I see little or no evidence of any such ‘accommodation’. Indeed, traditionalist and Ricardian literature and their respective websites are replete with strident and in some cases intolerant views on Richard’s guilt or innocence. Unfortunately for the disinterested observer, too much of this writing is polemical: some for him but most against him. Professor Charles Ross put his finger on the key issue for modern historians: “ The extraordinary problems of the evidence are highlighted by the difficulty historians have always found in providing an answer to the vital question: when and why did Richard seek the throne for himself?”  Clearly, anybody wishing to write a balanced piece about Richard has to struggle with the paradox of his behaviour before April 1483 and the crimes he is accused of thereafter. Professor Ross assures us that the modern approach is to ignore the Tudor tradition in favour of inferring Richard’s “…character and motives from a close scrutiny of the events themselves without preconceptions.” Ross further argues that modern historians have a much better understanding of the Tudor tradition and a wider knowledge of fifteenth century English politics, adding for good measure that this has resulted in “…a more critical appreciation of the value of the Tudor tradition and a certain unwillingness to throw the whole bodily out of the window, especially when it can be confirmed by contemporary evidence…” Even for a neutral observer, these comments raise two obvious issues. First, one wonders how closely the events of these times can be scrutinized given the ‘extraordinary problems’ of the evidence alluded to. Second, the suggestion that the Tudor tradition is confirmed by contemporary sources simply begs the question, since the probity of the contemporary material is precisely the issue disputed by Ricardians. The Tudor writers may simply be repeating the mistakes of fifteenth century sources. The rescue of Richard’s bones from a municipal car park and their reinternment in St. Martin’s Cathedral, Leicester is a historic moment, which I welcome. It enables people to focus on his humanity, which is a much-needed balance to the Tudor inspired caricature we are familiar with. We know what he looked like, what he ate, what he drank, that he had scoliosis, and exactly how he died — in graphic detail. Nevertheless, his reinternment with honour has done nothing to close the rift between Ricardians and traditionalists. More worryingly from my perspective, is the impression I get that the drama surrounding his discovery and reinternment, and the keen debate it has provoked, may be transforming the last Plantagenet king into a cult figure. Moreover, the discovery of his bones, invaluable though this is, does not actually advance our knowledge and understanding of the defining events of his life: the bastardization and deposition of his nephew Edward V, and the disappearance of the two Princes in the Tower. A dearth of reliable contemporary sources, the growth of an enduring legend, epitomized by Shakespeare, and the passage of time have conspired to prevent us from being able to establish what truly happened during the critical period of Richard’s life. I accept that on the material we have now we cannot know the truth. We can interpret the material according to our personal agenda, we can analyse peoples’ movements and actions and we can infer their intentions and motives. But, as things, stand we can never know what the actual truth is. For me, therefore, the search continues….
. It was (and is) unheard of for a Parliamentary bill to be repealed without being read. It is indicative of Henry VII‘s desire to suppress the truth.
. Charles Ross – Richard III (Yale 1999) at page 64.